A lever is a mechanism that can be used to exert a large force over a small distance at one end of the lever by exerting a small force over a greater distance at the other end. 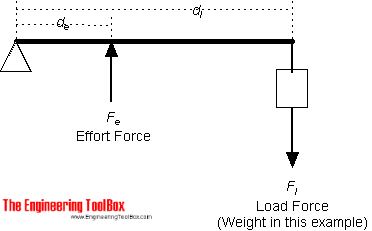 This calculator can used to calculate lever effort force. It can be used for both metric and imperial units as long as the use of units are consistent. 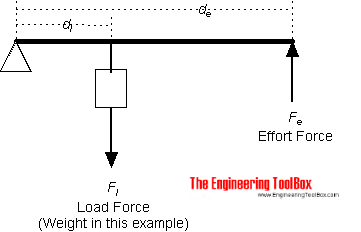 The formula (1) can be modified to express required load if you know the effort, or required distance from fulcrum if load and effort forces are known and so on. 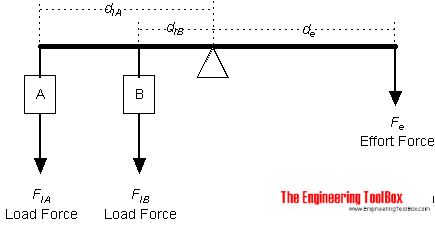 The level above where the fulcrum located between the load and effort force is often characterized as a first-class level mechanism. A level where the load and effort force are located on the same side of the fulcrum is often characterized as a second-class level mechanism. A force (weight) of 1 pound is exerted at a distance of 1 ft from the fulcrum. A lever mechanism where the input effort is higher than than the output load is often characterized as a third-class lever mechanism. 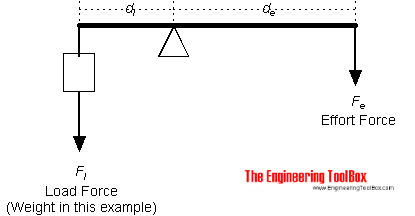 A force (weight) of 1 pound is exerted at a distance of 2 ft from the fulcrum. This equation is modified for three acting loads below. A weight A of 1 pound is exerted at a distance of 1 ft from the fulcrum. A weight B of 2 pound is exerted at a distance of 2 ft from the fulcrum, and a weight C of 3 pound is exerted at a distance of 3 ft from the fulcrum. Engineering ToolBox, (2008). Levers. 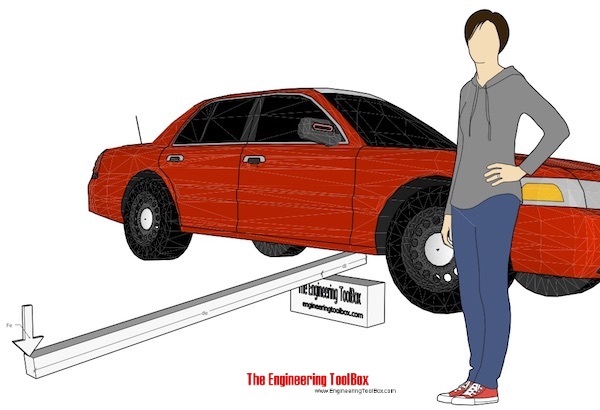 [online] Available at: https://www.engineeringtoolbox.com/levers-d_1304.html [Accessed Day Mo. Year].